How to Use Self-Backup to Protect Your System Configuration? NAKIVO Backup & Replication can protect virtual machines (VMs) against failures caused by disasters, software issues, or hardware failures. However, the software that performs backup also needs to be backed up. Only then can the data protection system be restored in the shortest amount of time and resume protecting your VMs. Among other exciting new features, NAKIVO Backup & Replication v7.4 includes Self-Backup, which backs up and recovers the product’s own settings. This blog post explores this new feature in depth. NAKIVO Backup & Replication can be run on a physical or virtual machine. There are many things that could cause either type of machine to go down (hardware failure, system failure, virus attack, natural disaster, etc.). If this happens to the machine running NAKIVO Backup & Replication, a new installation of the product can be completed in a few minutes – however, reconfiguring all the settings from scratch would take significantly more time. This is especially true for large environments with high numbers of VMs. NAKIVO Backup & Replication’s new Self-Backup feature helps you restore the product’s configuration in a matter of minutes. Rolling back to undo unwanted changes. If somebody accidentally applied undesired changes, you can easily “roll back” by restoring the correct configuration from the Self-Backup. Configuring a new instance after a crash. If the machine running the product fails, you can install a fresh instance of NAKIVO Backup & Replication on another healthy machine and restore the entire configuration from a Self-Backup. Self-Backup is enabled and performed once a day by default. You can change the scheduling settings or run a Self-Backup job manually on demand. The default retention settings (which you can edit) are to store last 5 recovery points. Self-backups are stored in backup repositories that are added to your Inventory. 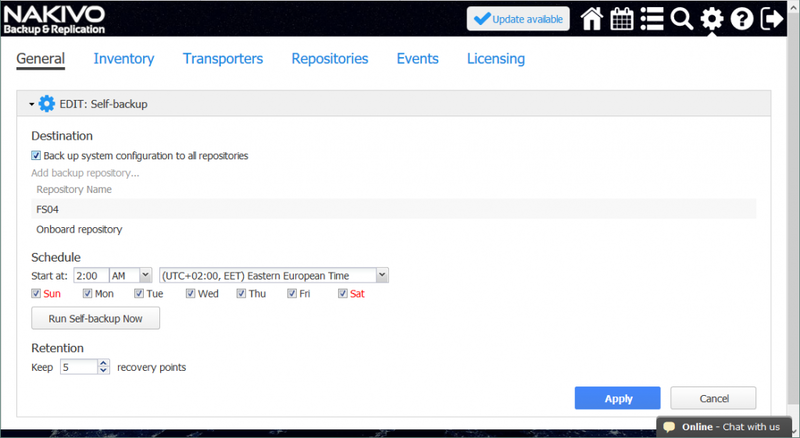 You can choose to use all accessible repositories for Self-Backup storage or select particular repositories. By default, the Self-backup feature saves backups to the first five repositories available. These default settings are likely to suit most users. If you would like to customize your Self-Backup settings, use the following walkthrough. You can access the settings of the Self-Backup feature under Configuration > General (click to expand Self-backup and see a preview of the settings). Click Edit to configure the Self-Backup features. Destination. 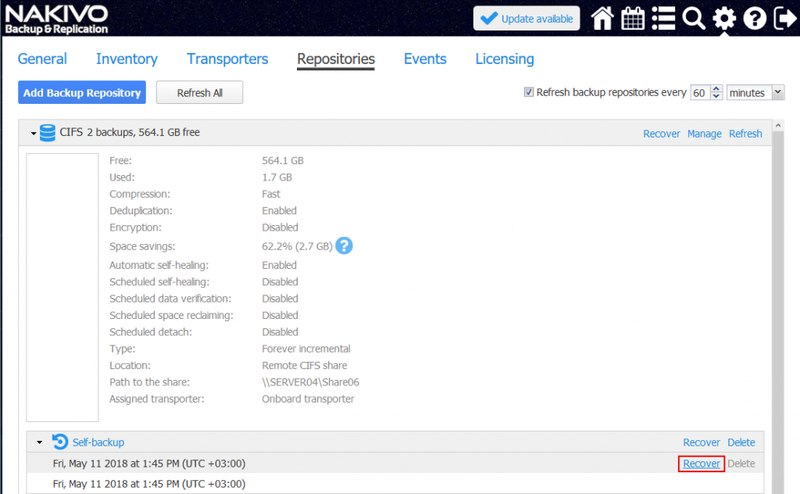 In this section, you can select which repositories to use for storage of Self-Backups. Schedule. In this section, you can select your time zone, the time the Self-Backup job is initiated, and the days of the week a Self-Backup is performed. Just input the time, select the time zone from the dropdown menu, and select/deselect the appropriate checkboxes for days of the week. Retention. 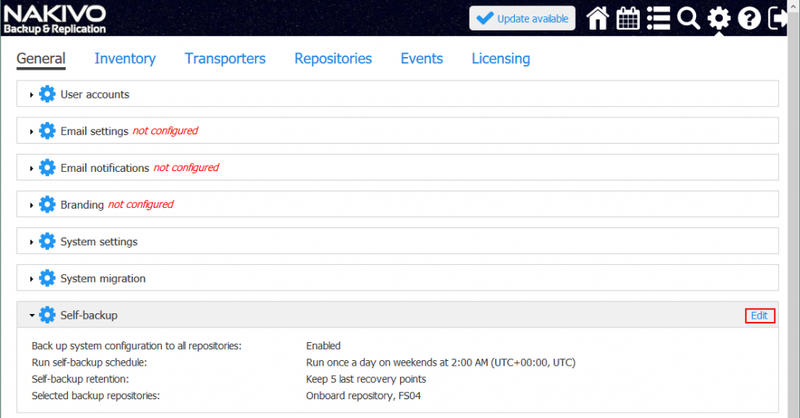 These settings allow you to define the number of recovery points that are kept in the backup repositories. New Self-Backups replace older recovery points. Let’s walk through adding and removing repositories to be used for storing Self-Backup. If you uncheck the Back up system configuration to all repositories box, you can manually remove particular repositories. Simply select the repository you don’t want to hold Self-Backups and click Remove. A confirmation message is displayed. In this example, all repositories have been removed from the Self-Backup list. Thus, there are no longer any items available in the Destination section. Since there are no repositories for Self-Backup, in Configuration > General > Self-backup you can see that the Self-Backup feature is now marked as not configured. You can easily add a backup repository for Self-Backup. Edit the Self-Backup settings – click Add backup repository and select the repository you want to use by ticking the checkbox. 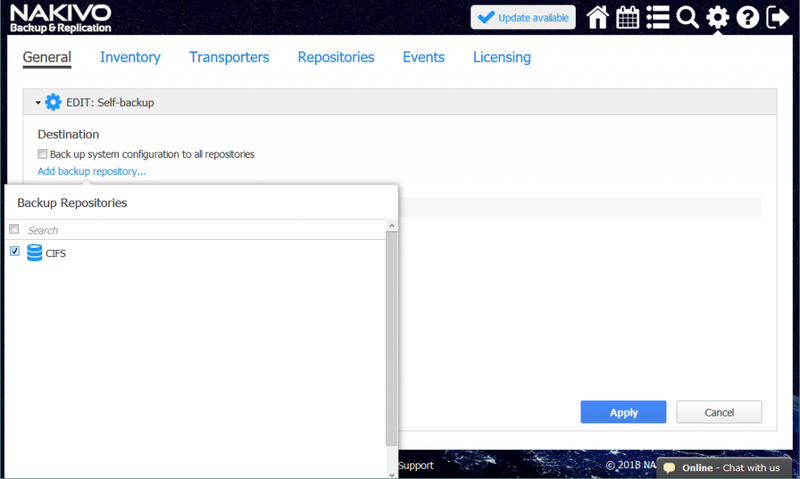 Note that only repositories that have already been added in the product configuration (Configuration > Repositories) are visible as options in the list on the Self-Backup settings page. Now the Self-Backup settings are configured. If you would like to run a Self-Backup immediately, click the Run Self-Backup Now button. Let’s now demonstrate how to recover the configuration of NAKIVO Backup & Replication from a self-backup stored in a repository. 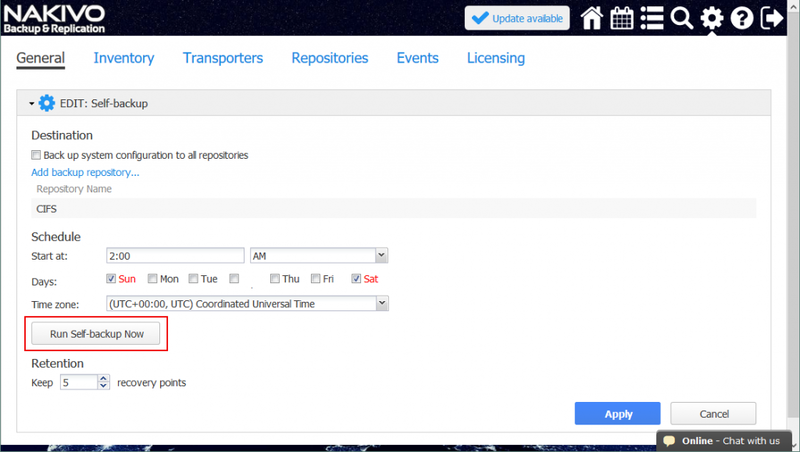 Go to Configuration > Repositories, select one of repositories that contains a Self-Backup, click Self-backup, and then click Recover. Then select a recovery point and click the Restore button. Wait while the system configuration is restored. When the Self-Backup restore is finished, a success message appears. In Multi-Tenant installation mode, each isolated tenant can use Self-Backup to back up their isolated settings of NAKIVO Backup & Replication for recovery purposes. Thus tenants can use the Self-Backup feature in Multi-Tenant mode much in the same way that regular users can use Self-Backup in the single-tenant installation mode. The global admin of a Multi-Tenant installation can export or import any configuration for system migration. Watch our video to learn how to protect your entire system configuration with NAKIVO Backup & Replication! Using Self-Backup saves time because you don’t need to configure the settings of the product from scratch after a clean installation following a disaster or migration. Having a configured instance of NAKIVO Backup & Replication available at all times protects your virtual machines by ensuring a backup or replication job isn’t missed. Don’t forget to back up your backup software and improve the reliability of your virtual environment’s protection. Try the feature for yourself in the full-featured Free Trial of NAKIVO Backup & Replication v7.4.